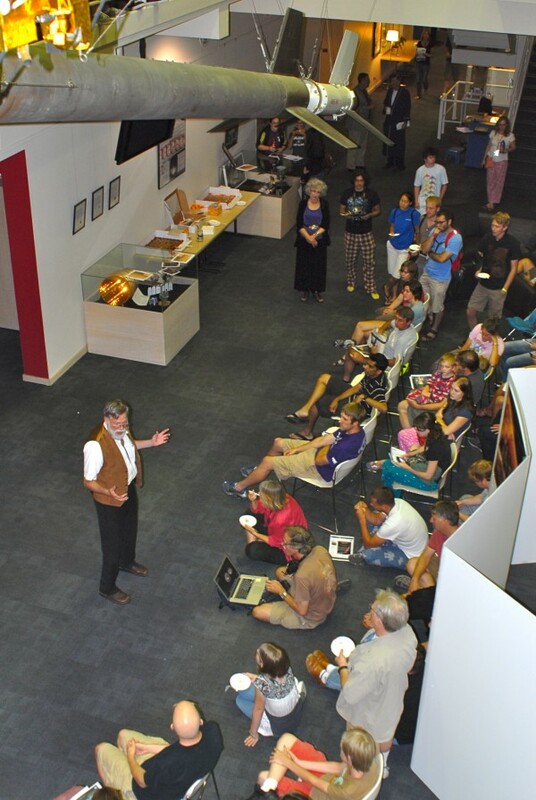 An estimated 350 people gathered at LASP Sunday night for activities surrounding the landing of the NASA Mars Science Laboratory (MSL) Curiosity rover on Mars. The late-night public event brought local citizens, LASP staff, and space industry experts together to witness and celebrate Curiosity’s dramatic landing on the surface of the Red Planet. A number of young space enthusiasts accompanied their pajama-clad parents to experience the historic event. Televisions throughout the LASP LSTB building were tuned to live NASA-TV coverage as the 11:32 p.m. MST landing drew near. 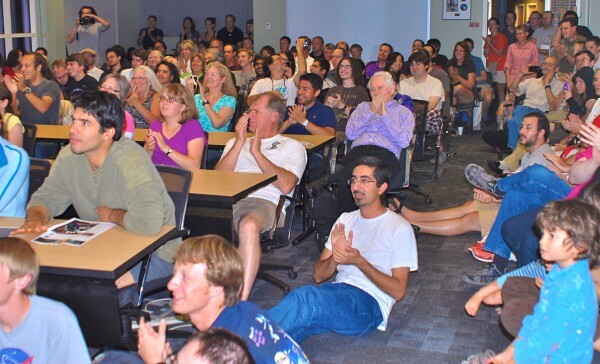 Crowds clustered in an auditorium and large conference room, spilling out into the main lobby and the Mission Operations hallway as Bill Possel, LASP Mission Operations & Data Systems Director, and Jeff Parker, professor at the CU Boulder Colorado Center for Astrodynamics Research, narrated the anxious moments leading up to the landing. The audience exploded into ecstatic cheers as the rover gently touched down on the surface of Mars’ Gale Crater, breaking the tension of MSL’s “seven minutes of terror” plunge toward safety. Applause burst out again as Curiosity returned images of its own shadow, cast on the surface of Mars. Prior to MSL’s landing, pajama party guests enjoyed a Curiosity-decorated cake and a game of “Pin the Lander on the Planet.” LASP scientists Bruce Jakosky and David Brain gave educational talks about Mars and the Curiosity mission, while Larry Esposito provided an impromptu presentation for overflow attendees. The event lasted well into the morning, wrapping up with an emotional press conference on NASA-TV. With the one-ton Curiosity rover onboard, the NASA MSL landing was the most complicated Mars landing ever attempted. Curiosity will now begin a two-year investigation of Mars’ surface geology to determine if the Gale Crater region was ever hospitable to primitive life. For more information on LASP E/PO events, please visit http://lasp.colorado.edu/home/about/events/special-events/.